Last week, fans everywhere simultaneously celebrated and mourned the last installment of Harry Potter. Encompassing ten years, seven books, eight films and spanning a generation, the series meant something very dear to me -- so much so that I spent all of last week obsessing, remembering, and writing about it. And then my friend Jessica thought of the perfect way to say goodbye - a booze-fueled, Harry Potter themed party. And just like that, I was off to San Francisco! After my second viewing of the film, Jessica and I got to work on our themed treats. 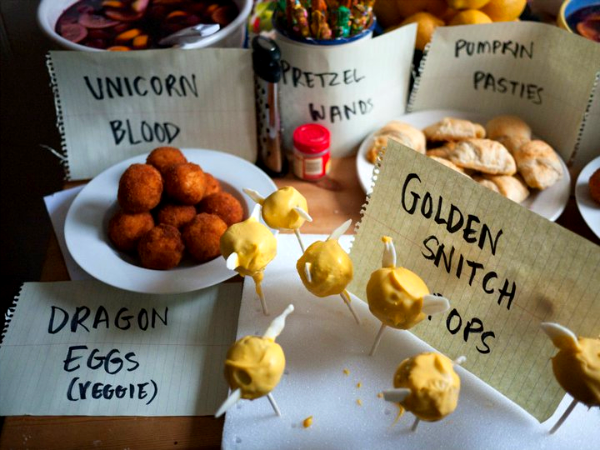 The menu consisted of unicorn blood (sangria), butter beer, pumpkin pasties, dragon eggs (Italian suppli), pretzel wands, magic mini macs, and golden snitch cake pops. Admittedly, the pretzel wands were mostly for show. Dipped in frosting and sprinkled with stars, they weren't exactly tasty but they were fun to duel with. Jessica and I both studied abroad in Italy and fell for the country and its food like school girls with a crush. Suppli, Italian risotto balls wrapped around a chunk of fresh mozzarella and then deep fried, were one of our favorite afternoon snacks. She made half with pancetta for the non-vegetarians and named them Dragon Eggs. If eating meat is wrong, I don't want to be right! 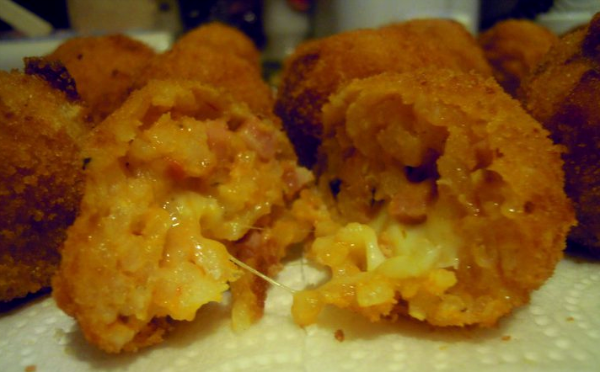 The suppli were just as I remembered them from Rome, oozing with cheese and addictive. 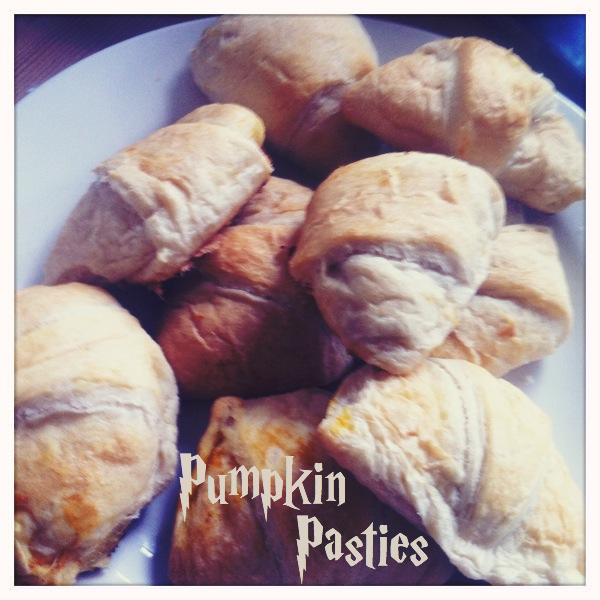 The pumpkin pasties were perhaps the easiest to make. We realized too late that the recipe we found required pie dough rather than croissant dough, but they turned out just as well! Add eggs and sugar to a mixing bowl and mix until well blended. Stir in the pumpkin, butter, salt and spices. Add milk and mix well. Spread a dollop of pumpkin mixture at the top of the individual triangle pastries. Wrap up the edges of the dough and pinch edges. Bake at 400 degrees only until crust is a light golden brown, around 10 minutes. Dust with cinnamon and serve at room temperature! Cake pop, you saucy minx. I thought I had conquered you. We were on good terms. Everything was going well, I felt confident in our relationship... until I set out to make you even fancier. 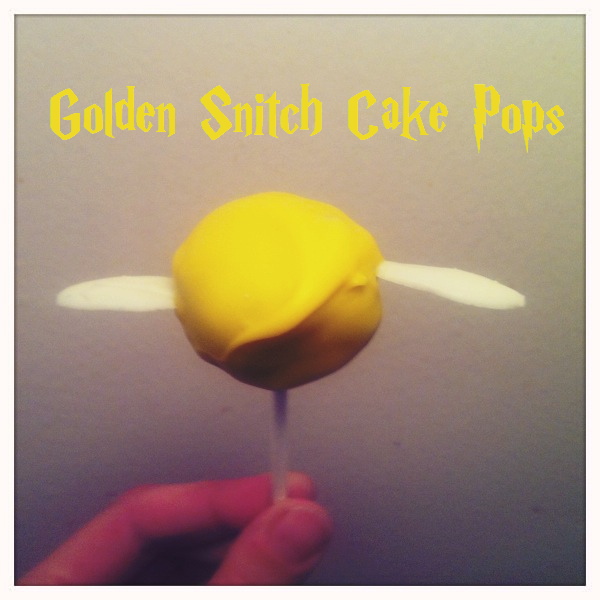 Making golden snitch cake pops is by no means an original idea but it is a tricky one. The method is mostly the same; bake a cake (this time I made mine from scratch), crumble and add frosting to form little balls. Add lolipop sticks and freeze for several hours, remove and dip in melted candy coating until it hardens. Sounds easy, right? Still, they turned out just as scrumptious and adorable as I had hoped. Here are the two recipes I used for yellow and chocolate cake. I dressed up as the sweet and spacey Luna and partied with Harry, Bellatrix, Ginny, and some Death Eaters! 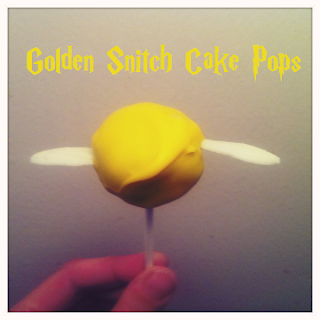 Did you dress up or make any themed food for the Harry Potter premiere? Let me know in the comments. 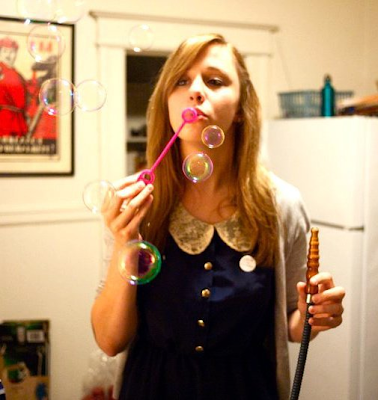 Also a HUGE, loving thank you to Miss Amy Dozier for lending me the use of her gorgeous photos for this blog. (RIP Nikon Coolpix) You're an amazing photographer!